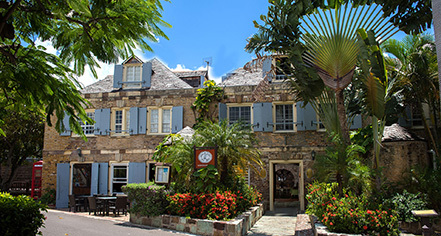 The Copper and Lumber Store Inn is one of the historic buildings, which together make up Nelson's Dockyard. Since during the day this place gets much visited, it is recommended to spend here a night or more to enjoy the area in the quiet evening hours. Unlike day visitors the people, who are staying here, don't pay an entrance fee. Gillian at reception was exceptionally friendly, when we checked in and she also helped us with the luggage up some stairs. No complaints either about the other staff working at reception on the next days. The only rather unfriendly person we met here, was the lady serving the breakfast. Our room was the 'Badger'. For this we had to go up some stairs to the first floor. After opening the door to the studio there were more stairs inside. We didn't mind and the place looked aesthetically very pleasing with the shiny belt parquet and the sloping ceiling. There was a separate small kitchen and a quite big walk-in closet with many clothes hangers. The bathroom had plenty of storage space, free toiletries and a good shower. We understood that there couldn't be a balcony in a protected historic building, but we still missed a place to hang up our wet bathing suits and towels after swimming in the sea. The bed was comfortable and it we slept well, until in the middle of the last night an intermittent strong noise from some kind of machine (pump, air-conditioning?) kept us awake for quite some time. A modest continental breakfast is included in the room rate and is served in the restaurant, which also has some nice outdoor seating. One day we had a good lobster salad there for lunch. For dinner though one has to go elsewhere. This place exceeded my expectations, partly because it is affordably priced. 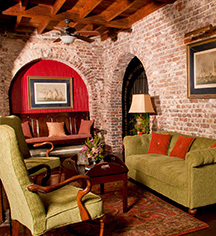 The hotel is a historical landmark, but the rooms are big, breezy and comfortable. there are lots of places to eat nearby. A great place to stay in English Harbour. I don't see how it is possible to beat the Copper and Lumber Store for its location. The beautiful marina with spectacular yachts directly outside, the historic restoration of the hotel itself, the convenience of many restaurants (not to mention the very handy Covent Garden grocery store a few minutes walk away) within an easy stroll. To be upfront, the five-star rating is based on our stay in the wonderful Royal Sovereign Suite, with its postcard view of the yachts. We had spent one night in a lesser room, a two-story arrangement with the bathroom downstairs and more modest appointments with no view; that we would not have rated five stars. But the Royal Sovereign gets five with no hesitation, so shoot for that or the other suite across the hall if you can. The staff was unfailingly helpful -- Jillian (hope I spelled it correctly) stood out during our time there, but they were all great and deserve the accolades. Continental breakfast was not lavish, but perfectly adequate with eggs, pastries, juice and tea. After a later stay in the St. John's area, I would unhesitatingly return to Copper and Lumber on any future visit to Antigua. Stayed for 1 night. The room was perfectly ok. Clean and comfortable. The staff where very unfriendly and rude. It felt like they really couldn't be bothered. The continental breakfast was ok but nothing special. Our apologies if that were your experience. This is never the norm as our staff are renowned through the yachting industry for being among the friendliest and always willing to go the extra mile. So we must apologise for what must have been a difficult day. Thank you however for pointing this out as we always strive to be at our best everyday. This will certainly help in our continued endeavour for excellence. Have a great day and certainly do look forward to hosting you once again. The Copper and Lumber is an affordable alternative to the more touristy resorts. You truly feel like you've stepped back in time with the beautiful Georgian architecture. Being walking distance from many restaurants and a small supermarket is a benefit, as well. We enjoyed eating the continental breakfast with views of the harbor every morning. Strongly recommend a walk to Pigeon Beach (mostly uphill- not for the faint of heart) and a visit to Boom restaurant/ infinity pool. I can't say we had great sleep, as our room could be noisy and the beds were too soft. But we would recommend the Copper and Lumber Store Inn nonetheless. Thank you very much for your honest review. It is certainly appreciated and all points noted. Hope to see you some day again!